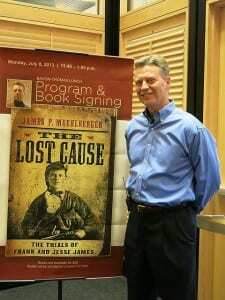 BOOK REVIEW: Muehlberger, James P. The Lost Cause: The Trials of Frank and Jesse James (Westholme Publishing, LLC, 2013) 255 pp. index, timeline, bibliography, end notes, some photos, illustrations, and maps, hardcover $18.96. 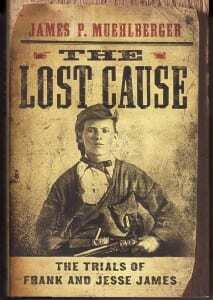 The author begins the book with a Prolog where he expounds on the “myth of The Lost Cause.” He seems to believe that the only cause of the Civil War was slavery. There were a number of other causes and many of them had to do with economics. One of the main themes of the book is the Gallatin, Missouri bank robbery. He makes a fair case that this may have been a planned assassination and not a bank robbery at all. Jesse James and maybe Jim Anderson set out to kill Major Samuel Cox who killed Bloody Bill Anderson during the war. However, Captain John Sheets, who looked much like Cox, was killed instead. The author does not believe Frank was involved in this event at all. The author makes much of the suit that was filed against the James boys after the Gallatin affair. The attorney who filed the suit was Henry Clay McDougal. He represented Daniel Smoote, whose horse had been taken by the fleeing gunmen. Smoote won the suit and as settlement was awarded the horse that had been left behind the by the supposed Frank and Jesse James. The author relies on McDougal’s book, Recollections: 1844-1909, for much of what he says about the suit and the aftermath. Throughout the book McDougal is on a real ego trip and much of what he says is open to question. McDougal says he was working with Samuel Hardwicke, a Clay County attorney, and the Pinkerton Detective Agency as early as 1869. However, all the evidence that this reviewer has been able to locate shows that the Pinkertons did not become involved in trying to catch the James boys until after the Corydon, Iowa bank robbery in 1871. Further, Samuel Hardwicke did not begin to work with the Pinkertons until the spring of 1874. McDougal claimed that Jesse James tried to kill him twice because of his involvement in the law suit. This claim is not supported by any other evidence that this reviewer has been able to find. We have only McDougal’s word for this. There are any number of inaccuracies in the book. Several names are incorrect. Union General James Blunt is identified as Jones Blunt. Sheriff James Timberlake is identified as Henry Timberlake. One of Frank James’ key attorneys during his trial at Gallatin in 1883 is first identified as John F. Philips then suddenly he becomes Thomas Philips. The author says Susan James and Allen Parmer married in Kentucky instead of in Clay County, Missouri. Archie Samuel’s age is given as thirteen when the Pinkertons bombed the James-Samuel home in 1875. He was actually not yet nine years old when he was killed. Zerelda Samuel’s age is given as fifty-five at the time of Frank’s trial when she was really fifty-eight. The date of Frank James’ surrender to Missouri Governor Crittenden is stated as October 5th 1881 instead of 1882. There are also a number of omissions that seem odd. For example, the hanging of Dr. Samuel by Union troops is discussed but the severe beating the same troops gave Jesse James is not mentioned. One of the key attorneys in Frank James’ trial in Alabama is never mentioned either. He was Robert W. Walker, a graduate of Princeton and Columbia University Law School and a former member of the Alabama Supreme Court. In summary, this book adds little to the knowledge of the James-Younger gang and it contains a lot of misinformation.